(May 22, 2015) Louis Johnson (see his Facebook page), the renowned bass player who was one-half of the popular musical group The Brothers Johnson, has died at age 60. 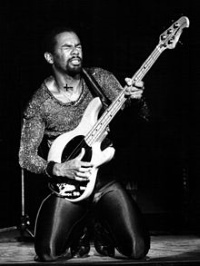 Both as a member of the sibling duo and as a session musician, Johnson was lauded as one of the great bass players of his generation. His slap-bass style earned him the nickname "Thunder Thumbs" and brought a fresh sound that was just right for the emerging funk music scene of the 70s and early 80s. To the public, the Brothers Johnson appeared to come out of nowhere in 1976, topping the charts with the infectious dance hit "I'll Be Good To You" and landing monster hit after monster hit for the next half decade. But brothers George and Louis Johnson paid their dues before hitting the top and continue to influence musicians more than two decades after their peak. The Johnson brothers - George on guitar and Louis on bass - got their first break backing popular R&B acts in their hometown of Los Angeles. Their reputations increased, and they landed jobs in Billy Preston's touring band when Preston was at his commercial peak, also writing songs for the keyboardist. Quincy Jones then hired the brothers to tour Asia with him, ultimately leading to Jones assisting them in obtaining a deal with A&M Records and agreeing to produce their debut album, Look Out for #1. Look Out began a five year string of platinum albums and top ten hits that highlighted the brothers' funk chops but with the danceable, lush production that epitomized Quincy Jones' work of that era. Among the biggest hits were "Strawberry Letter 23," "Get The Funk Out of My Face," "Ain't We Funkin' Now" and the irresistible Rod Temperton dance hit "Stomp." The duo began a commercial descent with 1981's Winners and they never truly bounced back. After splitting for a two year period, the brothers returned in 1984 with the Leon Sylvers-produced Out of Control (which landed the minor hit "You Keep Me Comin' Back"), but continued to spend more time on side projects than on their act. By the time of 1988's Kickin', the Brothers Johnson's chart-topping days were over, though they continued to reunite for tours from time to time over the next two decades. Johnson also had a solid career outside of the group. He was a much sought-after bassist, working with virtually every major star in the 70s and 80s, including Michael Jackson, Michael McDonald, Donna Summer, Stanley Clarke and many, many more. He also recorded several solo albums and issued instructional videos on how to play the bass guitar. Louis Johnson was a key player in the growth of soul and funk music who had a role in many of the greatest songs of an era. He will be deeply missed.